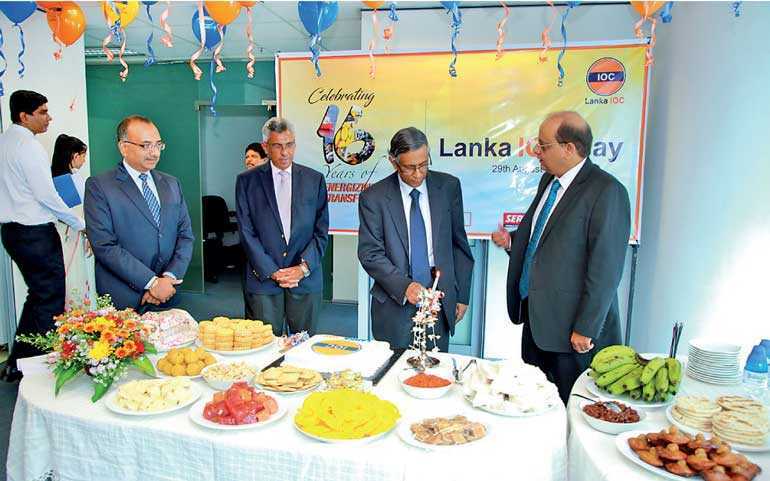 Lanka IOC Plc commemorated 16 years of operations on 29 August by organising several activities at its head office, Trincomalee Terminal and retail outlets spread across the country. Every year Lanka IOC marks ‘Lanka IOC Day’ on 29 August. This year there were major celebrations at the Lanka IOC Plc headquarters. In conjunction with the celebrations, Lanka IOC Plc also organised a blood donation camp and free health camp. There was huge public participation in the blood donation camp organised at the company headquarters at the World Trade Centre, Colombo. A total of 102 units of blood was donated to the Government Blood Bank at Rangama Hospital. Apart from this camp, the company also donated wheelchairs. Lanka IOC Managing Director Shyam Bohra donated wheelchairs to Ven. Hathiyavela Chandrananda Thero Sri Sumangalaramaya, Ampitigala Anguruwathota and to other low income people, as recommended by the Social Services Department and Helpage Sri Lanka during the camp. Speaking at the occasion, Bohra stated that the company, which was registered 16 years ago in Sri Lanka and is a truly Sri Lankan company listed on the Colombo Stock Exchange, is the top publicly listed company in the Sri Lankan energy sector. Today, Lanka IOC is recognised as an enduring brand intrinsically linked with the hearts and minds of the Sri Lankan spirit, fuelling it to reach greater heights. He also stated that another important issue at the workplace that needed focus was maintaining safe and hygienic practices at all times. For a company that is constantly dealing with oil in one form or another, adherence to standardised safety practices is extremely important. He called on everyone to take a pledge this Lanka IOC Day to implement safety practices at all times. At Lanka IOC Day, he called on all LIOC employees to rededicate themselves and passionately demonstrate the core value of integrity to transform the future growth trajectory of Lanka IOC and take Lanka IOC to an even greater path of success in the years ahead. He extended his heartfelt wishes to every member of the LIOC family and wished for Lanka IOC to witness new heights of glory in time to come. He thanked all Lanka IOC stakeholders for their contribution to bringing Lanka IOC to this stage. He presented a long service award to the employees for their contribution to the company. He also thanked the Sri Lankan Government for its continuous support without which it would have been impossible for Lanka IOC to transform the petroleum sector of the country.